You can see the many production fields we work in below. Providing a complete live broadcast package to the world's premier sporting occasions in High Definition. In 2010, in collaboration with our partners Helimedia, we suppplied the complete aerial coverage for the FIFA World Cup Football. 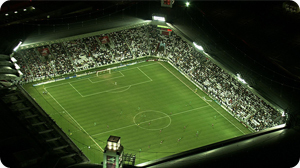 This involvedrunning 6 separate aerial units covering 10 stadiums across South Africa. This was the first time the World Cup had included aerial footage and it was exclusively shot with our Cineflex V14 camera systems. For more details please read the following CreativeCow article here. At the Athens Olympics 2004, Helifilms became the first company ever, to provide the entire fleet of live broadcast helicopters for an Olympic Games. 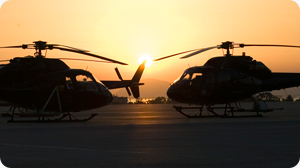 First we sourced a total of ten suitable helicopters and comprehensively surveyed them to ensure that that they were prepared to the very highest standards of maintenance. 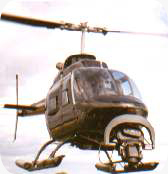 We chose six AS355 Twin Squirrels and four AS350 Single Squirrels. All helicopters are built to slightly different specifications depending on the initial customer's requirements. They needed to be on high skids, some needed sliding rear doors, some needed floatation gear and some needed particular hard-points for attaching all the various combinations of camera and RF equipment. Next we had to achieve full technical approval to fit all this equipment, but we had to do so under three different sets of rules - European, Greek and the country where each helicopter was registered. Test flights were carried out to ensure that none of the broadcast equipment would interfere with the normal aviation instruments, radios, navigation gear and engine control systems. Our forward team in Athens built a hangar, installed offices, prepared the operating area, sourced the fuel supplies and negotiated for months with the Greek and Olympic authorities on all the little points of operational detail involved in running such an intense show. By late July we were ready and on the 6th August our "squadron" arrived in formation. In late December '04 we moved to Qatar, where the Doha Asian Games Organising Comittee were proudly about to launch their mascot for the 2006 Asian Games. Helifilms again provided the full broadcast aerial unit with live television pictures downlinked to the OB central control room. 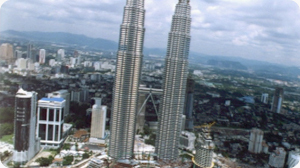 2006 was spent producing the aerial unit for the Commonwelath Games in Melbourne and the Asian Games in Doha, Qatar. We are currently working on major international events and we'll post news of them as soon as our client confidentiality allows. Play Commonwealth Games 2006 Showreel. Play FIFA World Cup South Africa 2010 Showreel. It's true ... best aerial coverage I've ever seen - any event. Well done!! We first worked on Large Format in 1990 when we shot the Rolling Stones at Wembley. See our Large Format page for more details here. We have either acted as a full aerial unit supplier, crew facilitator or stock footage library for various feature film productions. To see more of our feature film work vist our credit list. The Cineflex performed its magic in the few moments of sun we had. There are some drop dead gorgeous shots.One thing I can tell you is the steadiness is unbelievable. Some people will think that we have computer animated the whole thing! You did a great job. We are very happy with the results. 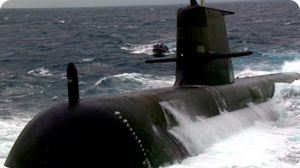 The above image was taken from an Australian Navy TVC for director Jamie Doolan and Melbourne production company, The Guild. 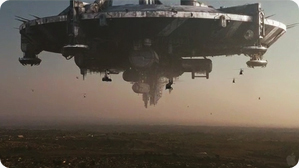 See the full tvc and the Cineflex's incredible stability in action below. Click here to download or play a larger version. system again in the future. 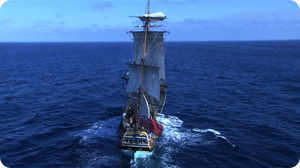 Ross Allsop, Producer of Nine Network's Drama series, "Canal Road"
In 2006, we supplied the aerial unit for the award winning documentary ''Captain Cook' (December Films) off the coast of Hobart, Tasmania. As a production company our corporate clients are diverse. We've shot for golf courses, real estate developers, government agencies and multinational companies. Contact us for more information.